SUBSCRIBE TO OUR AWESOME CHANNEL BY CLICKING IN ANY OF OUR BUTTONS BELOW! Life can get busy and we can get caught up in the busyness of it all. It’s my hope that Your Life Rocks causes you to pause and be really intentional about the life you are building. Part of living intentionally is developing traditions with your family. 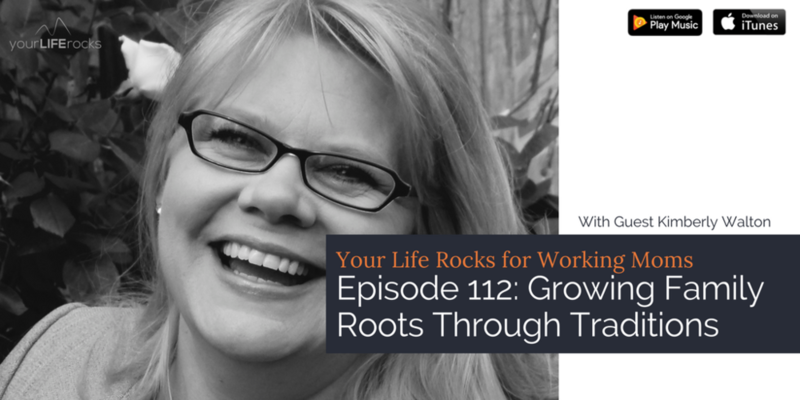 On this episode, our guest and marriage expert, Kimberly Walton from CherishedWives.com, explains how traditions can deepen your family and relational roots, create memories, and bind you all closer together. Sometimes we have traditions that we don’t even recognize as traditions. Think about it. What I found in talking with Kimberly, is that when I recognized what those traditions are and the impact that they have on everyone involved, it allows me to be more intentional about carrying them out year after year. Kimberly Walton is a marriage mentor, speaker, writer, and women’s retreat leader who specializes in working with Christian women to create and nurture wildly successful marriages. She is the founder of Cherished Wives International, a coaching practice dedicated to strengthening marriages and increasing intimacy and connection through her unique INLOVE approach. The IN LOVE program addresses the 6 principles that are part of successful marriage by focusing on the whole person and taking a wholehearted approach. Kimberly comes from a place of personal experience and draws on her formal and informal education to mentor on the “how-to’s” for developing greater intimacy, increasing passion, embracing vulnerability, and strengthening relationships. She believes in a solution-focused approach to strong marriages and blends in humor, tenderness, scripture and even a touch of call-you-on-your-stuff when working with her clients whether it be in a one to one setting or a large group. Kimberly is married to the love of her life and lives in California. Special thank you to Kimberly for creating an intentional planning tool for our Life Balance Members to help them design traditions to strengthen their families throughout the year. Ready to take creating balance to the next level? Join Life Balance Membership today! Exciting NEWS! WE HAVE LAUNCHED OUR VERY OWN OFFICIAL APP. Free to Download!